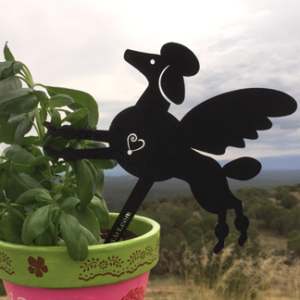 Steel dog cut-outs for your garden or patio. 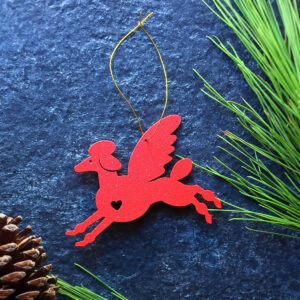 Pet Angel Mobile has is perfect for hanging on a window looking out, outside on a patio, or from a tree. Our Pet Angel Garden Companions and Markers are great gift ideas for someone who just got a new puppy or kitty, they’re Guardian Angels. Or to express sympathy and honor a pet’s spirit if they lost their lovable four-legged family member. They serve as guardian angels or remembrance angels. Pet Angel Garden Companions are perfect for placing in your garden, the backyard, patio, or under a favorite tree. Approximately 8” x 6” and have a 7” stake attached to the bottom of the pet for insertion into the ground or a pot.